WELLESLEY, Mass. -- Arlene Zallman, a gifted composer and long-time professor of music theory and composition at Wellesley College, died November 25 at her home in Wellesley, surrounded by her family and close friends. She was 72. Zallman graduated from the Juilliard School of Music and earned a Master’s Degree from the University of Pennsylvania, where her principal teachers were Vincent Persichetti and George Crumb. Upon graduation, she received the Marion S. Freschl Award for Vocal Composition. In 1959, she enjoyed a two-year Fulbright Scholarship to Florence, Italy, to study with Luigi Dallapiccola. 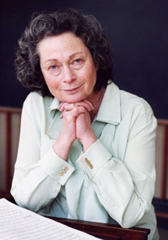 Before joining the Wellesley faculty in 1976, she held teaching positions on the faculties of the Oberlin College Conservatory of Music and Yale University. Her Three Songs from Quasimodo won awards from the National Endowment for the Arts and the ISCM. She received awards for her composition and performance activities from Meet the Composer, the Massachusetts Council for the Arts and Humanities, the Mellon Foundation and the Guggenheim Foundation. Beginning in 1963, she held seven fellowships at the MacDowell Colony, the nation’s oldest artists’ colony, where she was named the Faye Barnaby Kent Fellow (awarded by the Alpha Chi Omega Foundation). She was a Fellow at the Radcliffe Institute for Advanced Study during the 2001-2002 academic year. Zallman received important commissions from: the University of Texas Drama Department for her incidental music to Molière’s The Imaginary Invalid for solo singers, chorus, and chamber orchestra; the Concord Chorus for her Emerson Motets; the 1996 Seminar on Contemporary Music for the Young at the Rivers Music School in Weston, MA for her East,West of the Sun for treble voices and chamber orchestra; and, for the Town of Wellesley Community Orchestra, Quasi una serenata, an orchestral work. The Trio 1999, written for the Triple Helix Piano Trio, has become a staple in the repertory of the acclaimed ensemble. Three of her works were premiered in the Boston area: “and with ah! bright wings” (G.M.Hopkins) for SATB and organ by the King’s Chapel Choir; “Vox feminae” (texts from the Carmina Burana), a song cycle for soprano and piano with soprano Sarah Pelletier and pianist Elise Yun at the Goethe-Institut in March 2003; “Il sabato del villaggio” (Giacomo Leopardi) with the Lydian String Quartet and contralto Marion Dry at Brandeis University in June 2003. During the summer of 2003, Zallman was guest composer-in-residence at the Rocca di Mezzo Music Festival in the Abruzzi region, Italy, which featured her music for solo piano. Her works are published by the Association for the Promotion of New Music (www.subitomusic.com), and by C.F. Peters: Variations on a villanella, “Alma, che fai?” by Luca Marenzio for piano solo; Sei la terra che aspetta for violoncello and piano; Nightsongs for soprano, flute / alto flute, clarinet / bass clarinet; Trio 1999 for piano trio; and East, West of the Sun, for treble voices and chamber orchestra. Zallman was born September 9, 1934, in Philadelphia. She is survived by her daughters, Minna Proctor of Brooklyn and Martha Proctor of Pelham, and her grandsons, Silas Pilapil and Isaac Zalman Anastas. She was laid to rest November 29 at Wildwood Cemetery in Amherst. A memorial service and concert is planned for March 31 in Houghton Memorial Chapel at 4:30 p.m. In lieu of flowers, remembrances may be made to the Arlene Zallman Fund for students at the Wellesley College Music Dept. or the MacDowell Colony, Peterborough, NH.